Hi Readers — Believe it or not, this isn’t even a post about Sandy Hook. It’s about Tony Hawks and a photo he posted of himself skateboarding as he swung his 4-year-old daughter, who was not wearing a helmet. I believe in helmets. I love them. I make my kids wear them. But I do not believe that seeing one Instagram pic of Tony with his un-helmeted daughter is a huge problem (the way, for instance, ABC News does). In fact, to hope and pray for a day when every image we see in any medium is safety-tested, doctor-approved, drug-free, anti-bully, pro-vegan, un-retouched, community-minded, well-balanced, FDA-approved, vitamin-rich, child-friendly, smoke-free, and culturally balanced, is to hope for a day when all we see are ads for grapefruit. Although, come to think of it, people on some medicines can’t eat grapefruit. So maybe we’ll see ads for corn husk dolls. Not sure that’s all I want to look at for the rest of my life. – L.
I’m guessing not a lot of us have 5000 square foot skate parks in our backyards anyway. SUCH a pet peeve of mine! I used to work for a multimedia company that shall remain nameless (might rhyme with gartha blewart) where a whole, gorgeous story was rejected on similar grounds–it was about a hotel that builds snow forts for the child-guests to play in. Beautiful photos, but… What if the readers build snow forts that collapse on their kids?!!??!?!? In another article, an entertaining story in Maine, a photo was cut because a toddler was shown in a boat without a life jacket. Never mind that the boat was a rowboat shown tied to a dock, on a calm day, with many adults within arms reach. The sanitizing of the mass media is extreme and ridiculous. I love that photo. Wow. She is going to love having that photo when she is older. I would hold that it would be impossible for that four year old’s head to contact with anything firmer than her father no matter what was happening. I bet he’d sooner lose a leg than have her be harmed. So glad neither one has a helmet. And when he’s pushing the edge, he ALWAYS has a helmet. Not that it has kept him from losing teeth and breaking bones, but he wears one. When I see that picture I see a loving dad having a great time with his daughter. God bless him! It’s Tony Hawk. There are probably only a few less people on the planet who are less likely to fall off a skateboard. Myself, on a skateboard with my daughter would be unsafe; this is probably more safe than my daughter buckled into her carseat with the car sitting in the driveway. has anyone reminded ABC that even with a helmet she could break an arm or a leg or be paralyzed or get run over? I loved reading his response in one article “it’s more likely that you will fall while walking on the sidewalk than I will while skating with my daughter.” Amen! It’s about knowing our limits, not avoiding every possible risk. My sis posted a fantastic picture of my BIL throwing my niece up in the air. She had people fuss at her because it was SO DANGEROUS. Part of it was a force perspective that made it look like he was throwing her as high as the 2nd floor balcony. They went on vacation in Costa Rica. Sis, BIL and the two nieces (17 and 4 Nephew was barely walking he stayed at the hotel with Nana) went ziplining. You would have thought they hung the girls upside down in an active volcano. That’s a great picture. While it wouldn’t be a safe thing for most of us to do, I think it’s plenty safe for him. Entirely different skill level there. If fans see him as a parenting role model, that’s not Tony’s problem. For that matter, reasonable parents should think twice before following the lead of any lifelong pro athlete with his/her kids. Lenore–if the media only allowed photos of grapefruit, that wouldn’t be very well-balanced, would it? Anyway, I think that this picture is really nice, and not inappropriate or “encouraging unsafe behaviour” at all. For (another) example, my Facebook profile picture shows me in the middle of a cartwheel (which my friend Sabine miraculously managed to get on her first try). Anyway, it never even occurred to me that that photo would “encourage dangerous behaviour.” While it might be dangerous for some people, it’s not dangerous for me, because I can do a cartwheel. Most people who can’t do it, don’t attempt it properly; they just do a “monkey jump” kind of cartwheel (hands on the ground, hop around the side). I see this kind of thing in yoga class sometimes too–I’ll modify a pose to make it more advanced (for example, I’ll do Full Moon instead of Triangle), and the teacher will get on me for that, for fear of other, less skilled people copying me and getting hurt. To that, I say, we’re all adults, and the point of yoga is to listen to your body. My body is saying that it wants to be challenged more. If other people are copying me instead of listening to their own bodies (and don’t dial it back if their bodies protest), then they’re the ones missing the point of yoga, not me. If I was teaching a yoga class, I’d obviously start with basic poses, and introduce the more advanced options after that, but if I’m participating in a yoga class, then I’m there for me. Also, one thing a lot of people miss is that “safety” is a rather broad term. Is it “safer” to sit on the couch and eat potato chips, than it is to go outside and skateboard? In the short term, maybe. In the long term, sedentary behaviour and junk food may not cause scraped knees and bruises, but they will contribute to heart disease, diabetes, various cancers, and stroke. Meanwhile, skateboarding carries the risk of some minor, temporary injuries, but it’s also an aerobic workout, which can actually prolong life. P.S., I know that there are lots of other physical activities that are safer than skateboarding; I just used that as an example this time, because of the picture in the article. Background info for those who don’t know: In the skateboard community, Tony Hawk is a god. He is one of the best skaters on the planet. As some said earlier, Tony Hawk on a skateboard is safer than most of us will ever be. Me on a skateboard? Splat. Tony on a skateboard? Ultra-safe. The chance of Tony Hawk falling off a skateboard is lower than you falling off a toilet. I’m going to respectfully disagree with this one. Y’all would be singing a different tune if it was Dale Earnhardt Jr taking his four year old daughter for a ride in the front seat of his car without a safety belt. Professional or no, as a public figure representing a sport (which I myself participated in, back in the day) should be wearing a helmet himself in any picture that is supposed to go out to the public. And the kid IS in danger: a broken arm is one thing, but a traumatic brain injury is a life-changer (or ender). …and anybody who thinks Tony doesn’t fall off a skateboard doesn’t know squat about skateboarding. Experts push themselves to the limits and they fall off just as much as everybody else in so doing. Maybe he falls off less than you, but he falls off. Here’s the thing for me… Tony, THE PARENT, decided that this was an appropriate activity for his child. He is well informed on the risks of skateboarding accidents. Better than most. He, THE PARENT, made the informed risk assessment call that works for his family. At last check, his call is legal. So…. NOT OUR BUSINESS. And Matt, the real statistical risks of a skateboarding accident vs. the risk of a high speed auto crash are not comparable. Is this the new Michael Jackson dangling his baby over the balcony? Your Dale Jr analogy isn’t very equivalent. If Tony Hawk were piggy-backing his kid while doing back-flips, or grinding down rails or something, I’d say you could compare that that to Dale Jr riding his daughter in the race-car with no restraints. Both activities would of course be quite dangerous, so I doubt you wouldn’t find either of them doing it. But a lazy skate around the park doing nothing fancy, well there’s no comparison. @Ann: Umm, no. This would be Michael Jackson holding his baby while doing the moonwalk. Dale Earnhardt taking his kid around the track at 20 mph. Let’s face it, this is something that Tony Hawk is arguably the best in the world, and while the pic looks dramatic, how many of us have spun our kids around in our backyards? That’s what he’s doing. This attitude is a pet peeve of mine as well. A friend once complained that a cooking show set a bad example by showing pot handles turned outward. I’d consider that a valid argument if it were “cooking with Barney.” That not being the case, while I think it’s good if professionals take the time to demonstrate proper methods when working before the camera, it’s not really everyone’s responsibility to set s good example for everyone else, all the time, as the first priority. 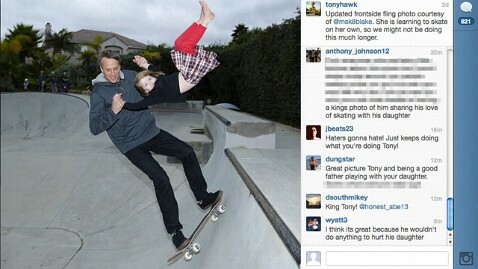 I have to laugh at those who condemn a parent for actions such as Tony Hawk. Their whole arguement “He is a pro and should know better than anyone.”…….But these people will not listen when told, he is a pro and knows what he is doing. As for Dale Jr taking a child around the track, in his stock car………..won’t happen. Those cars do not come with a passenger side seat. LMAO. People need to just back off, and remember to keep their mouths shut. Not their kid, not their problem. End of story. I applaud Tony for his responses. If it were me, I wouldn’t be so diplomatic. We took video of us riding down the stairs on an old mattress. I actually didn’t post the video to FB because I was worried about the backlash about how dangerous it was. The only person for whom it was even remotely dangerous, was my husband who was too heavy to ride the mattress all the way down and it stopped mid-stairs and threw him through the air for a few steps. I just think people need to chill out a little bit over stuff like this. I have a friend who was chided on her blog after posting a picture of her daughter in her carseat. Apparently several followers thought the straps were too loose and to far down. Seriously? Tony Hawk holding is daughter on the skateboard is still safer then me holding mine on the solid ground. He is less likely to fall on skateboard then me on ground. That last part of the post reminded me of *Brave New World*- not good. What if corn husk dolls give our young girls the wrong impression? Pretty soon they’ll develop corn husk complexes, worrying their skin is not rough or stringy enough! I already loved Tony Hawk and now I love him even more. That being said… to Jenna, we are much more likely to get in a car accident than many of the other things that we risk as free rangers. Thus, I do think that the carseat is nothing to be free range about. The straps should be used appropriately. The chest clip is a CHEST clip, not a stomach clip. It can kill a child by causing trauma to their abdomen. Just like a seatbelt it is designed to hold the body in by a part that has bones. And the straps need to be tight, because in a car accident, things compress. And if straps are already loose, the kid is probably coming out of there. Just trying to give you some perspective to what the people were probably trying to say. Knowing how people are, they probably said it in a jerky way though. But the advice could save your friend’s daughter’s life if taken. As for the helmet thing… There is a clear correlation between more helmet use and less activity, at least when it comes to bicycles. Every time mandatory helmet laws have passed, cycling among children has fallen dramatically. No one is really sure why; if it’s the perception of danger, the hassle, the cost… No one really knows. But the cold, stark fact is that far, far more people die from sitting on the sofa than from not wearing a helmet while riding. Great photo of a dad having fun with his daughter. People need to chill. I would assume that Tony Hawk’s daughter has grown up around skating and has knows how to handle herself on the course. (I’d actually be more surprised to find out that she’d never stepped on a board than to find out that she was able to ride.) And I assume that he wouldn’t do this if he felt there was a likelihood that he would harm his daughter. Could she get hurt? Sure. She could also get hurt in any number of other ways in the course of day to day life. But is a risk/reward situation, and in Mr. Hawk’s mind, clearly the reward out weighs the risk. So people ought to be minding their own business on this one. Oh, and @Matt: If Dale Earnhardt, Jr. wanted to noodle around a private track in his backyard at a slower speed than he races (because I do know “squat” about skating and I can assure you that Mr. Hawk is not doing the same sort of skating here with his daughter that he would be in a competition, obviously), I would not be singing a different tune. Dale Earnhardt Jr. driving slowly on a private track in his backyard is far safer than I am driving in traffic on any given day. I don’t put my son in his safety seat because I’m think that I’m a bad driver, I do it because there are many, many circumstances on the road that I cannot control. But a track in your backyard? And you’re the only one on it? Hell, drive with your kid in the front seat, let them enjoy the view. My absolutely favorite part of this is the TITLE. It’s true, NOT EVERYTHING IS A TEACHABLE MOMENT!!! And I am a teacher!!! I cringe when every conversation, every argument, every movement is ‘monitored’ by adults. Sometimes it’s ok to just let it be. These idiots make me so angry. When I worked at a community newspaper, we ran a photo on the front page of a mother sledding with her child in her lap (I think the child was about4 or 5). We actually got an irate letter about depicting an unsafe activity, and shouldn’t we know better, etc. etc. Ridiculous. That really makes me wonder about ice-skating. I started in grade school and we never wore knee pads or helmets or anything. Do they make you wear helmets nowadays? Also, I’ve seen kids as young as 2 out there with skating parents holding them up on their skates and don’t think anything is wrong with it. I laughed sarcastically when I saw the “expert” criticized was from Disney. Good lord! Has any one organization exploited children more than Disney, both directly (their actors) and indirectly (families who let that tripe into their homes)? OK. Color me an idiot. Usually I’m a champion of the Wild and Reckless. But this recalled to mind a scene from this past summer, when I saw a father putt-putt by on a moped with his daughter barely hanging on and with no helmet. A little disturbing. Now in REAL LIFE, I may not much care. Or I might think the guy’s a fool and write him off. But here’s a Public Figure, with an Audience, and a photo being WorldWide Distributed. . . and there should be some concession toward the potentials of a teaching moment. I deeply believe that the various photos of people wearing bike helmets, in ads, etc., have helped lead more people toward wearing helmets and thus generally increasing safety. Ugh. Why does the media think they are our parents and have sole responsibility for trying to get some sense into us? I equally hate that all kids’ TV shows now seem to have an educational aspect, especially those aimed at younger kids. Being able to have fun or a good laugh is very important in life too… So is learning to assess risks for yourself without having to turn to an authority figure to tell you what to think. And I grew up in Europe where no one wears a helmet when cycling. We often break the law here in Oz by not wearing one. The benefits of helmets when cycling are debatable and there is no unambiguous research proving otherwise. Unlike car seats and seat belts, even if Europeans seem to be a bit more blase about those too. I’m a former teacher, and I homeschool my seven kids. I always laugh at the idea that every kids’ game or show or toy needs to be educational, because I know that plenty of them do a crappy job of teaching anyway. A lot of the toys that supposedly teach reading skills actually foster poor, lazy reading techniques. 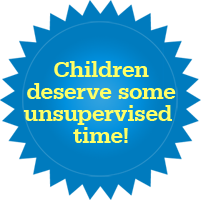 IME, kids learn a lot more from simple, unstructured play coupled with quality time with loving, attentive adults than they will ever learn from Barney. There are several aspects to this debate that are much more concerning to me than the fact that she does not have a helmet. For example, no shoes. Kudos to Mr Hawk for defending his skill and not apologizing to the busy bodies trying to teach him how to skate. Far more concerning is the authoritative tone taken by Mrs Connor from Disney. Is she some sort of safety expert? A covert Child Protective Services agent? I doubt it. It has correctly pointed out that helmets are very limited in the protection they provide. They will protect the scalp from bruises and lacerations in low speed accidents, but will not prevent concussion at higher speeds. There has been no decrease in the number of head injury related deaths in bicycling or skiing in the last ten years, even though helmet use is nearly 100% in those activities. Mrs. Connor uses her position as a Disney spokesman to give erronous advice to millions of parents, promoting over-reliance on safety equipment instead of supervision, participation and skill development, all of which are personified in the photo. The other concern is the growing lack of logic and comparitive risk. Is there any proof that ANYONE, ANYWHERE injured their child attempting this stunt after seeing this picture? And yet, there are dozens of people–some on this site–who would blame Mr Hawk for those injuries. People who follow Mr Hawk’s feeds do so because they know he is the Greatest Skateboarder in the Entire World. They are no more likely to attempt this stunt than if they saw a video of a snowmobile jumping over San Diego Bay. And yes, this IS as safe as driving a race car at 20 mph on a closed track. But mostly, I’m dissappointed at Lenore. Corn husk dolls? Really ? Do you have any idea how flammable those are?? And if Mrs.Connor happens to be reading, I’ll present my credentials: I am an ER physician and a nationally ranked triathlete. While the daughter is in the air, there is no evidence that the skateboard is in the air. Or was in the air. I think he knows what he is doing. Honestly, I don’t really care about celebrities and their kids. They do silly things just like the rest of the world. And, as pointed out above, the perspective the photo is taken can make a huge difference. I really have no idea how fast he is going from this photo – I can swing my kids from a standstill, I am sure he can do the same while balancing on the board. This suddenly reminds me of the late Steve Erwin (the Crocodile Hunter) taking his baby son into the crocodile enclosure and letting him walk a few steps holding his hands, a few metres away from a grown croc, in front of an audience with cameras. Now that caused a media storm! I remember I was less concerned about the presence of the croc (he is the CROCODILE hunter!) than about the fact that the young baby’s head was hanging sideways in an awkward way. He didn’t sustain any damage though and is about 8 now, I think. I also haven’t heard of anyone trying to copy the behaviour and causing little babies to be gobbled up by big crocs. @Captain America, the fact that you “deeply believe” is exactly what we are trying to get away from on this blog. Faith is for things that cannot be seen or measured, like God, or love, or the Cubs winning the World Series. G.W. Bush deeply believed that Saddam Hussein had WMD in Iraq. Look where that belief got us. The problem is that we have lots of people, like you and Mrs. Connnor, and GWB, who deeply believe things that aren’t really true, like razor blades in candy apples. Unfortunately, Mrs Connor has been given a powerful platform by Disney and ABC (ABC failing to disclose this conflict of interest) to promulgate false safety information, while at the same time disparaging the reputation of a professional athlete. Which is ironic since ABC profits from showing Hawk performing at the X-games on its ESPN station. So, keep your belief in God, and love, and Santa Claus. But also, take the time to think critically and act rationally about those things that can be known and managed. Hawk can skateboard with his kid, because he’s just that good. So leave him alone and figure out your own life. And then get outside, take a little risk, and live a little. @Yan – It is likely partially the discomfort in wearing helmets. I don’t own a helmet. For the last two days I had to wear one – horseback riding and luge riding. They are damn uncomfortable. I’he done both activities without helmets in the past. Both are much more enjoyable without helmets. I’m on vacation so whatever but I wouldn’t seek out an activity where I had to wear helmets all the time. For ice skating the rule here is under 6 helmets are mandatory over 6 they are “strongly recommended”. Also mouthguards, wrist guards, and kneepads recommended. Helmets are great and all, but frankly you can’t put them on a child under at least age 1 and if you want to have toddler tool around the ice on bobskates if they won’t/can’t/don’t have a helmet whatever. Even the under 6 crowd it should be parental decision. My bad. The collusion between ABC and Disney is noted in the news item. @mysticeye Hockey injuries happen mostly because of collisions. Head can get crashed with big force in those situations. Collisions in hockey are very common and collisions in figure skating are rare. Figure skaters are more likely break arms/legs or to overextend them (not sure about the correct word). Helmets would not help a bit. Same with cuts, figure skater would have to cut himself with his own skates, hockey player has 11 other players to cut him while running over him. You have a point about the number of head injuries not decreasing because of helmet use, but, I wonder about the number of neck injuries? The human skull is designed to take some impact, the neck isn’t. When you wear a helmet the forces that it protects the skull from are transferred to the neck. Funny that Dale Earnhart Jr. should be mentioned here, since his father died from this type of injury. You know, when I first saw this pic in the news, I couldn’t figure out why people were upset by it (and didn’t care enough to read the article). I’m 47 years old, and I managed to survive without wearing a helmet – and I had some epic wrecks. Not one of my friends grew up with brain damage because we didn’t wear helmets, though you should have seen some of the jumps and stuff we built. Does that mean you shouldn’t wear helmets? No. Does that mean it’s the end of the world if you don’t? Again, no. Ladies and gentlemen, you are all discussing personal safety equipment, for recreational use. Should that not be a personal choice? Yes helmets help and yadayadayada, but in my opinion the nanny state has overstepped their bounds, by mandating them. My body, my risk, my choice. The only harm Hawk is doing to his daughter is by naming the poor child “Kadence Clover”. We finally have a good amount of snow, and been able to take the kids to the hills for sledding and tubing. It would be funny if it wasn’t such a sign of the times. A rough head count saw 3/4’s of the kids wearing helmets on the hill, and a few parents that were just there walking up and down the hill. The parents were not even on sleds! This was all fine and well. Mine were having fun, until a mother tried to stop them. I am in the tire business, and we brought along an inner tube from a farm tractor. It is huge. Eventually the kids wanted to see just how many kids they could pile on it. My job was to keep count. This mother did not simply say that her child could not join in, she told my kids and ME, that she wouldn’t allow this to happen. I took her aside, asked her to remove her child from the group. When she said that wasn’t good enough, that she wouldn’t allow any child to be endangered by this activity. I quietly, not infront of the kids, told her the following. 1. This is not your call. 2. They are not your kids. 3. And if she didn’t like it, to damn bad. Shut your mouth, and leave us alone. 4. If she continued to block my kids path, I would physically remove her. She left in a huff. Now because we own our own business, we are fairly well known, and I guess some of the kids when they got home told their parents about what went on. The only backlash has been requests to borrow the tube. You can’t be more professional at skateboarding than Tony Hawk. I think he is best equipped to play with a child on a skateboard, especially one he knows as well as his own daughter.